July 10, 2015 – July 10, 2015 – The Laboratory for Atmospheric and Space Physics (LASP) in Boulder reports that the MAVEN spacecraft is in the midst of its latest deep-dip campaign. On Tuesday, June 7th, the MAVEN navigation team executed a maneuver to lower periapsis by 24 km down to 123 km above the surface of Mars. This is the third of five planned deep-dip campaigns. The 24 km altitude difference may not seem like much, but it allows scientists to make measurements in an area where atmospheric densities are more than ten times what they are at 150 km above the planet’s surface. Each of the five campaigns last for five days. The first three days of the campaign are used to lower the periapsis, by gently firing the rocket motors to “walk” the spacecraft to its lower orbit. The remaining two days allow the spacecraft to collect data for roughly 20 orbits. 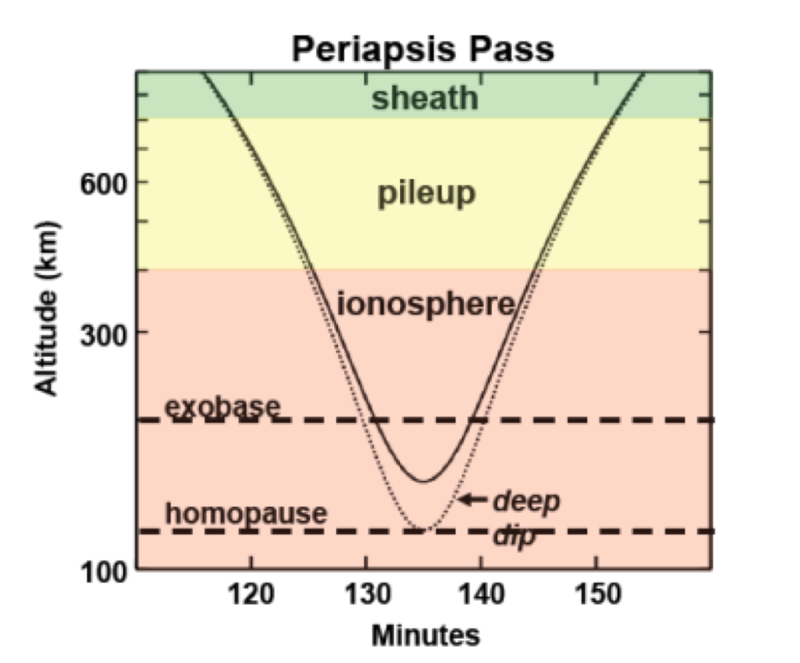 Since the planet rotates under the spacecraft, the 20 orbits allow sampling of different longitudes spaced around the planet, providing close to global coverage. At the end of the campaign, two maneuvers are conducted to return MAVEN to normal science operation altitudes. One of the major goals of the MAVEN mission is to understand how gas from the atmosphere escapes into space, and how this has affected the planet’s climate history through time. In being lost to space, gas is removed from the top of the upper atmosphere, but the thicker lower atmosphere controls the climate. The science team can combine the data from the deep dip campaigns with the results seen during its regular mapping to get a better picture of the entire atmosphere and of the processes affecting it. 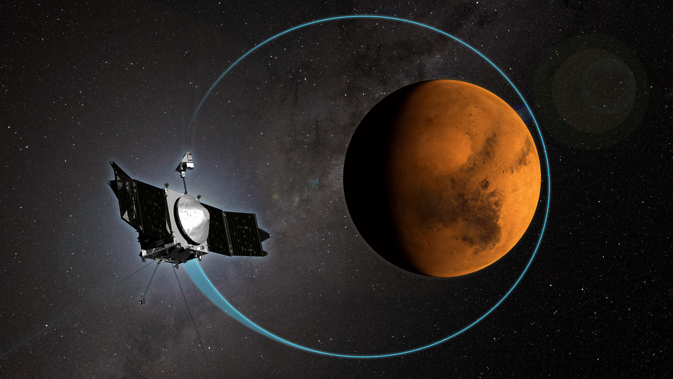 MAVEN’s measurements will allow scientists to characterize the current state of the upper atmosphere and ionosphere, determine the rates of loss of gas to space today, and extrapolate backward in time in order to determine the total loss to space through time. MAVEN is the first mission dedicated to studying the upper atmosphere of Mars. The spacecraft launched atop a United Launch Alliance Atlas V rocket on November 18, 2013, from Cape Canaveral Air Force Station in Florida. MAVEN successfully entered Mars’ orbit on September 21, 2014. MAVEN is led by Principal Investigator Bruce Jakosky, from the University of Colorado at Boulder. The university built two of the eight science instruments and is conducting the mission’s science operations. Lockheed Martin of Littleton, Colorado, built the spacecraft and is performing mission operations. NASA’s Goddard Space Flight Center in Greenbelt, Maryland, manages the MAVEN project and provided two science instruments for the mission. The University of California at Berkeley’s Space Sciences Laboratory also provided four science instruments for the mission. NASA’s Jet Propulsion Laboratory in Pasadena, California provides navigation and Deep Space Network support, as well as the Electra telecommunications relay hardware and operations.